Keith Beven is currently Distinguished Professor of Hydrology at Lancaster University in the United Kingdom. He also holds positions at GeoCentrum at Uppsala University in Sweden and the Laboratoire d'Ecohydrologie at the Ecole Polytechnique Fédérale de Lausanne in Switzerland. He started his research career with Professor Keith Clayton and Richard Hey, who supervised his PhD at the University of East Anglia in the 1970s. There he produced the first finite element model of hillslope hydrology. This was in the days when computer models were, physically, boxes of punched cards and when it took 12 hours of computer time on the University's "mainframe" computer to simulate 12 hours of real time. Following his PhD, he worked as a post-doc with Professor Mike Kirkby at the University of Leeds. A central element of this work was the development of what is probably the most referenced hydrological model in the world at present, namely TOPMODEL. His work on TOPMODEL, which has been used in more than 30 countries world-wide, can be credited with a fundamental increase in our ability to model distributed hydrological processes. Following research work at the Institute of Hydrology in Wallingford, Dr Beven started his academic career at the University of Virginia in Charlottesville, USA. After a second spell in Wallingford, he returned to academia in 1985 to a permanent appointment at Lancaster as Lecturer, Reader and, then in 1991, as Professor. Earlier this year, 2009, he was made one of Lancaster University's 14 Distinguished Professors. He has been Head of the Hydrology and Fluid Dynamics Group at Lancaster and was instrumental in the formation of the Centre for Sustainable Water Management in the Lancaster Environment Centre. He has been a visiting professor at the KU Leuven, UC Santa Barbara, EPFL Lausanne and Uppsala University where he was recently the King Carl XVI Gustaf visiting professor in environmental research. He is the author and editor of seven books and over 300 refereed journal articles. Professor Beven's reputation, although originally based on the development of fully distributed hydrological models, has also encompassed random particle models for surface and subsurface transport and the ADZ model for pollution incident prediction. In recent years he has become well known for his work on uncertainty modelling. He is the originator of the Generalised Likelihood Uncertainty Estimation (GLUE) Methodology. This seminal work on uncertainty estimation has been applied to a wide variety of fields, including rainfall-runoff modelling, flood inundation, flood frequency estimation, sediment transport, recharge and groundwater modelling, the impact of change in hydrological systems and forest fire and tree death modelling. He is the co-author of the fourth and fifth currently most highly cited papers in hydrological science and has the highest h-index of any internationally known hydrologist. Professor Beven is without doubt one of the most distinguished British hydrologists of his generation. His work has been recognized, not only in his own country, but throughout the world and for this he has received many prestigious awards such as the Linnaeus Lecture Award at Uppsala University, the Dalton Medal of the European Geosciences Union and the Horton Award and Langbein Lecture Award of the American Geophysical Union. One of Keith's particular strengths is his ability to see things from a number of different angles. For example - and I quote - "In my academic research I have developed ways of trying to imitate landscape dynamics by means of computer simulations but one of the fascinating aspects of this as a research area is the sheer impossibility of capturing the wonderful natural dynamics of the landscape without ambiguity by approximate mathematical means. Mathematics can have its own internal beauty; but the nature of water flows and the way in which they interact with rock and light are there for all to see and appreciate, with the sound of flowing water adding another dimension". Anyone interested in the source and relevance of that quote should go to www.mallerstangmagic.co.uk to fully appreciate how good a photographer he is. "Ignorance is bliss: seven reasons not to use uncertainty analysis"
"Surface runoff at the Horton Hydrologic Laboratory (or not?)" "On modelling as collective intelligence"
"So just why would a modeller choose to be incoherent ? " and Routledge have recently published a book of his entitled "Environmental Modelling: An Uncertain Future ? ". Last, but certainly not least, Keith is known by all as one of the most modest and approachable of colleagues. He is easy to get on with and is always willing to help others: qualities that lead his students to catch his enthusiasm for the science of hydrology and hence ensure that his ideas are past on to future generations of hydrologists. There is a lot of uncertainty in environmental modelling, but there was no uncertainty among the representatives of IAHS, WMO and UNESCO who sat on the Nomination Committee this year and decided to award Professor Keith Beven the International Hydrology Prize for 2009. I must start by admitting that this is one prize that I never thought I would be awarded so the invitation to be here tonight came as a real surprise. 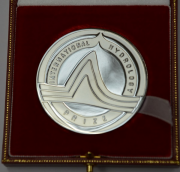 I have always thought of the International Hydrology Prize as a recognition for those who have done something really useful for the practical application of hydrological science in the real world, particularly the developing world - which would have been really pertinent today here in Hyderabad. I suspect that there are many people who think I do not qualify on that count - for much of my career I seem have been highlighting the problems of applying hydrological theory in a way that they would not consider useful at all! Hence my surprise. It was very generous of Arthur to give a reference to my photographic activities in his citation for this award, although I am sure that many of you might consider it as really rather sad that the main hobby of a hydrologist is taking photographs of water. That is, however, also rather revealing of the pathway by which I got into the study of hydrology and why it has maintained my interest for over 40 years. Not only is water so important as a constraint on so many human endeavours but it is also very attractively dynamic: particularly the ever changing interactions with rock and light that attract the photographer's eye. It may therefore appear somewhat paradoxical (even if an artistic challenge) to try and capture this dynamic nature into a still image but this problem can nicely illustrate another influence on my research. Even the simplest of images reveals complexity in the nature of water flows that is hard to quantify and to describe by mathematical models. Because of nonlinearity, that small scale complexity can still have an important effect when we scale up to larger catchment scales. So, the implication is that our theory and predictions will be necessarily approximate, a problem compounded by the severe limitations we have to deal with in the techniques of hydrological measurement. I had the good fortune in my PhD thesis to develop a model that failed to produce adequate predictions for the small catchment I was studying. The model was based on the best hydrological theory available at the time - so ever since, I have been trying to understand why it failed, a path that has been much much more interesting than if I had developed a model that had worked. What that taught me was to be honest about the recognition of the real differences between reality, uncertain observations and uncertain models. What it has ultimately led to is an attempt to provide uncertainty estimation techniques in the GLUE methodology that allow us to be more honest about those differences in a structured way. Those techniques are not yet adequate (and not, for those of you have followed the on-going debate about GLUE, because they are not formally statistical - the types of epistemic uncertainties we have to deal with as hydrologists are not statistical either) but I have a strong hope that they might yet come to be considered to be useful by the practitioner. I must recognise that I would not be here if it was not for the help and encouragement and scientific debates I have had with many other hydrologists, including a succession of graduate students and post-docs at Lancaster. Among the most important friends and colleagues have been Mike Kirkby who gave me a job as a post-doc when I had nothing else in prospect; Jim McCulloch who gave me a job at the Institute of Hydrology when I had nothing else in prospect; George Hornberger who gave me the chance to work at the University of Virginia for an extended period; and Peter Young who gave me the chance to join Lancaster University where I have now worked for 24 years. All have been important influences on my thinking and along with many others have made me think much more deeply about our difficult science. It is worth adding an aside here for the encouragement of young hydrologists. Some of you may have already heard me say this when I gave the introduction to the Dalton Medal presentation to Mike Kirkby at the EGU last year. I may also need to remind many of you that it was Mike Kirkby who originally thought of the topographic index idea - not me (though I have since discovered that Robert Horton got really really close in a paper in 1938 that is reproduced in the IAHS Benchmark papers series). My role in the development of TOPMODEL was to create a working model based on the index. As Arthur noted, TOPMODEL has of course been very widely used - and very widely misused - since. In the process, our original paper has received a very high number of citations. The encouragement to all the young hydrologists here is that the 1979 paper was originally rejected by the Journal of Hydrology. Eamonn Nash, the editor who dealt with it, thought that the enormous effort of the topographic analysis required - which in the 1970s essentially had to be done manually - would mean that it would only ever be of local interest. This was rather important to me at the time as it was only the second paper I had submitted. Fortunately, the paper was later accepted by the IASH Hydrological Sciences Bulletin - clearly far more forward thinking at that time - and is now one of their most highly cited papers. So, there are three lessons here for young hydrologists. The first is to make sure you publish in the IASH Hydrological Sciences Journal, it leads to great things. The second lesson is to look forward to what might be possible in the future, even if it is not now. The third is not to get downhearted if your first paper is rejected, it may yet become a very highly cited paper and you may yet get to receive the International Hydrology prize. In fact do not even get downhearted if you have 5 papers in a row rejected by Water Resources Research. When that happened I wrote to the editor at the time asking what the world record for successive rejections in WRR was because having got to 5 I really wanted to go for it... he wrote back saying they did not keep such records but would still be happy to receive any of my future papers for consideration !! Thinking about our difficult science is not, of course, enough. As a practical science in which uniqueness of place plays an important role, we also need observations and improved observational techniques. This has a direct bearing on the estimation of uncertainty and the evaluation of models as hypotheses. If I can finish by pointing to the future, the most important thing I can say is that the current concern of many modellers with uncertainty estimation is not the most important question, nor should it be the end point of a study. I say this despite the fact that I have advocated that all papers published in hydrology - both model and field results - should include an uncertainty analysis. Howeer, estimating uncertainty actually poses a further question - how can that uncertainty be reduced or constrained, or better models differentiated, by the use of additional or improved or different types of observations. The implication of uncertainty estimation is that modellers and field hydrologists should work more closely together. There have been many such calls before of course - this time however hypothesis testing within the context of uncertainty estimation provides a context for doing so much more effectively. It is worth noting that the field hydrologist has a real advantage in this framework, since observations (taking proper account of uncertainties) can demonstrate the inadequacy of a model hypothesis (to the chagrin of the modeller and the joy of the field hydrologist). So there is a real incentive for future work in field hydrology arising from the need to assess and constrain predictive uncertainty. It should be a fun period for hydrological research - at least for the field hydrologist - as we work some of these issues through together. Thank you again to the Association for this award, and to all of those on the committee who thought that my not-so-useful exhortations to modellers to be more realistic about their claims and predictions were worthy of such a great honour.